You're stuck on an island in the middle of the sea. Fortunately, you're stranded with a Chef, who knows how to cook a mean seafood dish. Gather the fish he requires and drop them into the pot without letting the natives interfere. If you enjoyed the game, why not try the patched version? It's playable in-browser, and lots of things have been tweaked to make the game a little easier to control! There's a lot to love about this game: the beautiful music and visual style, the relaxing nature, the goofiness of the natives, and the frantic action when you catch a fish. But I just feel like the main loop wasn't very appealing, there was no way (that I could tell) to try to get a particular type of fish so most of the time you were just throwing away every fish until you got the right one. I appreciated the small cauldron once I figured it out because it added to the freneticism when you caught a fish but at the start it was very confusing because I wasn't sure why the catch didn't count, I would have just missed the pot. Still I played it all the way to the end and enjoyed the outcome and my time playing, good job. That is the most relaxing music I've heard in a game in a while! It made me want to keep playing, and then the natives would piss me off, then I'd hear the music and I'd go back to fishing!! It's a shame you couldn't get the fishing rod in to whack the natives, that would have been so cathartic! You know, whacking the natives was one of the original mechanics! I had to cut it out due to time constraints and the size of the island though. Really glad to hear that you had a nice time playing! I gave up after many tries. It seemed way too difficult to get the fish in the pot. I occasionally managed to dodge the natives but somehow it didn't register the fish getting to the pot. Maybe the hitbox is too small? Keeep in mind that a game is way easier for the developper than the player, as you got to play the game a lot more than any of us! Yeah, dropping the fish should have been waaaaaaaaaaaaaaaaaaaaaaay easier! After playing it for so long I just got attuned to the mechanic and decided to up the challenge, which was a bit too much! Thank you for playing, though! Loved the whole atmosphere this game had, the artstyle was really good, the music was relaxing, and the controls were innovative. Sadly the randomization factor with the fish colors made it a little repetitive and frustrating, so the gameplay took a hit for that, paired with the unreliability of the pot it kinda ruined the experience. But I still really liked it. Sorry about the flimsiness of the controls! And I do agree with you on the randomisation factor - it's down to chance when you get your fish, so you could be waiting for quite a while. I tried to make the time waiting enjoyable with the ambience though, but there's so long someone can wait! The more colourful fish are rarer than the common coloured ones, which was meant to give you more of a challenge in finding them, but I think I just needed to really iron out the randomisation values in favour of what fish was needed... or something... Bah! Beautiful and good music, fun fishing mechanic too, but like other have said, dropping fishes is way too hard. Also it seems like you need specific fish each time ? Maybe make the different types more distinct from each other, because it's not easy to know for sure if you have the right one since you have to keep moving. Also, I went to 5/6 and tried for some time to get that 6th fish but had to quit because I got stuck. I had two fish at once on my line and it seemed to prevent me from moving. I tried dropping them but I was stuck. Yikes! Sorry about all the glitches! Chef will have the fish he needs floating above his head and the numbers, so that's how you know which ones to get. Maybe I should have made this a little more obvious! Happy that you had fun with it though! The fishing is really well done as Slyddar mentioned. It took me a moment to realize that they tap as well as grab (maybe the tap sound is too high pitched), but once I did it all clicked really well. 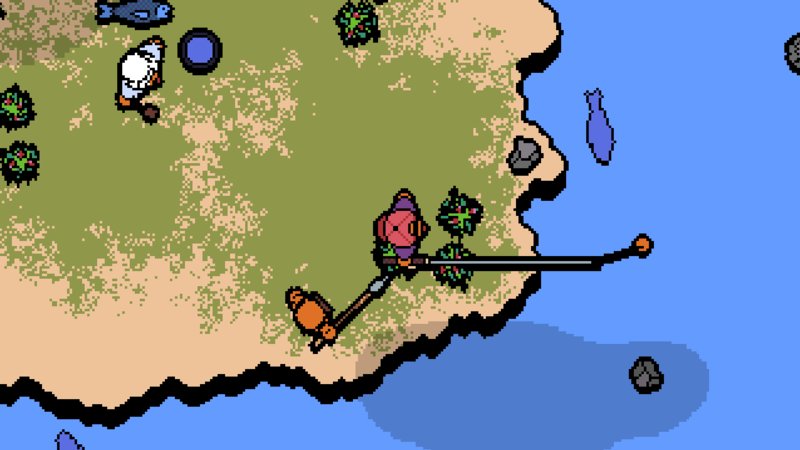 It's also surprising fun to swing and flail the fish around. I couldn't collect a single fish though after many tries. Eventually I got one to seem like it went into the pot (no fish body was left behind, and I think the sound effect was different), but the number didn't go up, so I gave up at the point. Very relaxing music, perfect for fishing away the day. The fishing was good , with easy indication of a catch. The main problem I had was either the natives knocking the fish off, or not being able to place it in the bucket. Caught about 15 fish, and only delivered one. Probably just me though. As for the theme, all I saw was one use for the tool, fishing. I thought the rod might of been able to fend off the natives too, but no? Coding and graphics were pretty good though, so well done on your entry. Thank you for the kind words! It is a bit difficult to drop the fish in the pot... I should have made the radius a bit bigger and the natives a bit slower! Originally the rod was used as a weapon to whack away them, but I ran out of time!